More recent OECD reports do not include Canadian data. Source: CICH graphic created using data adapted from OECD. Starting Strong II: Early Childhood Education and Care. 2006. https://www.unicef.org/lac/spbarbados/Implementation/ECD/StartingStrongII_OECD_2006.pdf -accessed July 25, 2015. According to a survey conducted by the OECD, in 2004, Canada invested 0.25% of GDP in early childhood education services. That compared to 2% in Denmark and 1.7% in Sweden and Norway. There are many benefits to investing in early childhood education – both to children and families and to society at large. 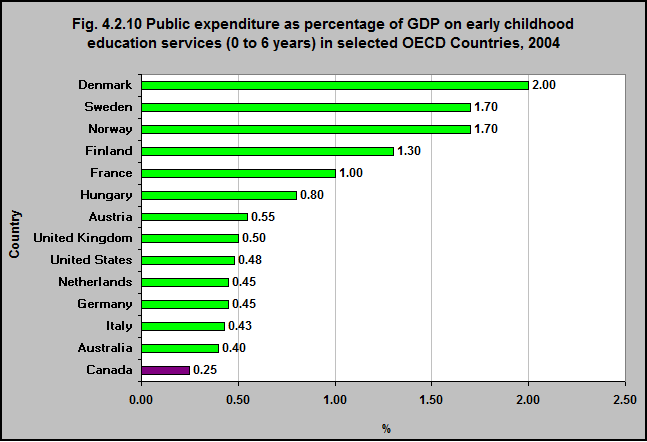 1PF3.1: Public spending on childcare and early education. OECD – Social Policy Division – Directorate of Employment, Labour and Social Affairs. 2016. https://www.oecd.org/els/soc/PF3_1_Public_spending_on_childcare_and_early_education.pdf -accessed July 31, 2017. 2OECD. Starting Strong II: Early Childhood Education and Care. 2006. http://www.oecd.org/edu/school/startingstrongiiearlychildhoodeducationandcare.htm -accessed July 24, 2017.